So the screen is 2.8", only 0.2" bigger than the N95-3 and N95-1. That is the worst description of the screen. I use to think about it like that before I got my hands on the N95-4. The screen seems siginificantly bigger in person. It is gorgeous, and it's pretty nice to load up your own videos or stream videos and watch it in landscape. The bigger screen allows for an extra standby icon as well. There is talk about how with the same resolution, when a screen gets bigger, you see more pixelated artifacts. I've never come across it on the N95-4 (my eyes can't tell), so don't let that talk be a deal breaker for you. The slider has a different feel compared to the N95-3 that I have on me right now. To slide the N95-3, it feels tight throughout the whole slide motion, and pops into place at either ends. 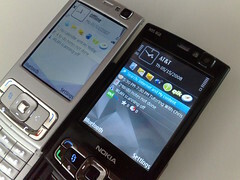 The N95-4 feels hollow when sliding from one end to another. It's not necessarily a bad thing, it's just that it feels different, especially the first couple of days that you use the phone. What's important to me besides the quality of the pictures taken on the phone is actually how fast the camera is initiated and ready to snap pics. 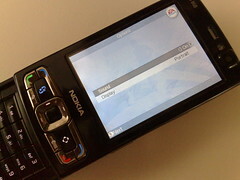 It takes about 3-4 seconds, which is OK, but not as fast as the N82. In terms of taking sequential pictures (how long it takes to take a 2nd picture after the first one is taken) is also decent for a phone, almost the same as the N82. The phone has 8GB of memory, enough for 90% of users (even for me believe it or not). However the speed of transferring content to or from the phone is painfully slow. It tops out about 0.7 MB/s over USB cable. For me this isn't a big deal, because I don't transfer content and music to my phone often, and certainly rarely before I leave the house. If you're that type of person who tries to load your phone with music the last minute before you leave the house, you'll be extremely disappointed. If not, then you'll survive. The Home Media application allows the N95-4 to become a client or a server of multimedia on your home network. The N95-4 allows you to stream or remotely watch content without downloading it (unlike the N95-3 which you have to download it to the phone in the latest firmware). However just like Ewan from AAS has pointed out, this applications needs to be revamped. Half the times it won't stream the content, and the interface and menu options are a little clunky for a Nseries device. A few times I've also been booted from the application which just adds to my frustration. It's also a pity that they took out the shortcut from the Gallery and left everything in the Home Media application. On the N95-3 all you have to do is set it up, and then you really don't need to go back to it to access your home network, you just go to the gallery. The phone's design is almost 2 years old, therefore it wasn't designed with N-gage gaming in mind. The phone is only good for one-handed gaming. During this time I tried using it with FIFA 08, and although it has great graphics for a cell phone, it's challenging using two hands to play the game. However using one hand, the learning curve is short and the controls are pretty straight forward. It's just a pity that the N95 8GB can't be used in landscape mode for practical gaming. The prominent bug that I came across was that the half the times the games would load in landscape mode although clearly the phone was in portrait mode. Well, for the first few days I thought that the phone is pretty stable. it is pretty stable when you have no applications at all. One you put a dozen applications or more, you can notice the difference with the speed of the menus. I was at a point that I'd experience 4-5 reboots in a week. This might not sound a big deal, but it is when 1 of those times on average is when you're trying to make a phone call. This can be fixed with future firmware updates, so I'm not too worried about it. So do I think if it's worth it over the N95-1 and N95-3? I'd say definitely over the N95-1. More RAM, bigger battery, bigger screen, more functional in the US. 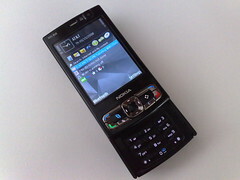 Is it worth upgrading from the N95-3? Maybe, depending on how much extra you have to pony up. If you can upgrade for less than $100, then I'd say it's a no brainer and you should go ahead. If you're in a crossroads between the N95-3 and N95-4, go with the N95-4. It looks better and has a great screen.